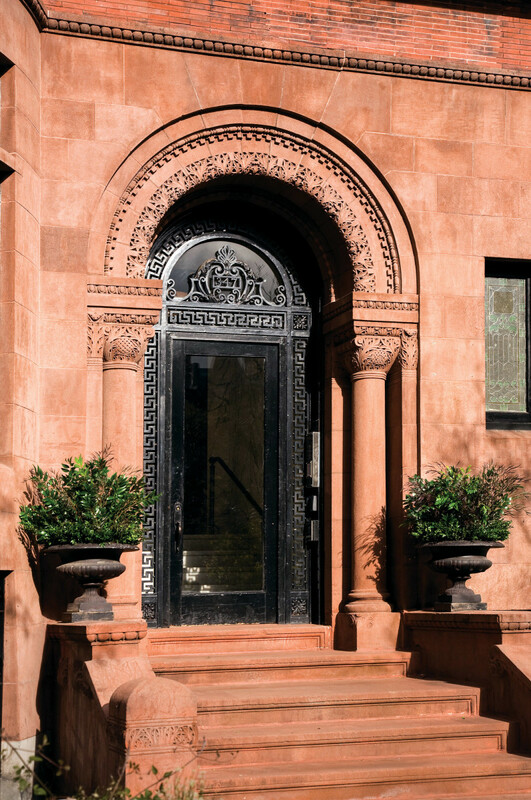 Dignity and a warm welcome were carved into column capitals and arch that comprises this townhouse door surround. Tall, deep, and narrow in their massing, townhouses enabled the development of densely populated neighborhoods with both attached and detached forms. With a growing population and westward expansion, they are as identifiable with Midwest cities like Chicago as they are with East Coast cities. 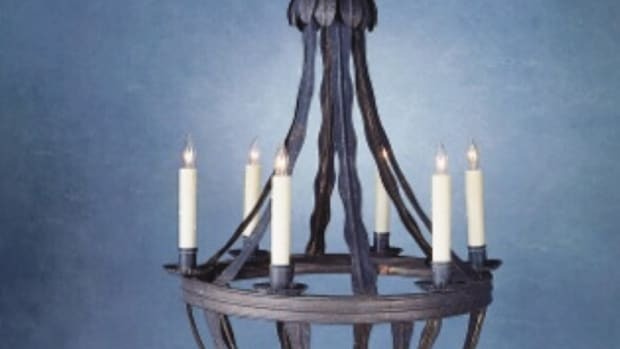 They were often distinguished by dimensional stone architectural details that are considered character-defining features today. Dimensional stone is shaped from natural stone that has been quarried. 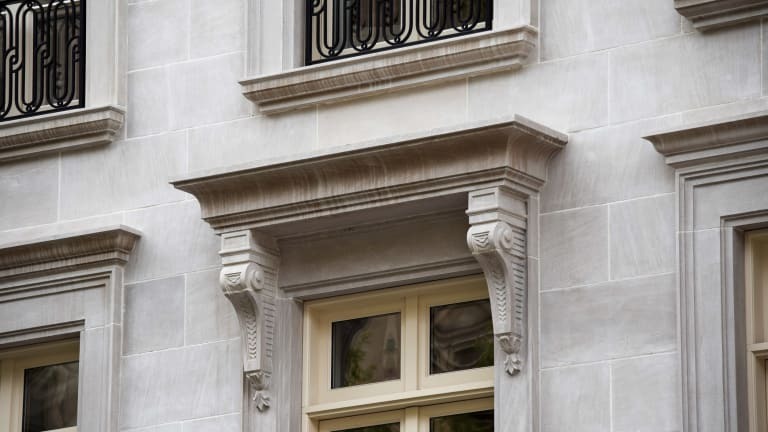 Gravity, salt, freeze/thaw cycles and less-than-durable stone types have often taken their toll on original lintels, steps, door surrounds, planters, landings, thresholds, railings, balusters and newell posts. 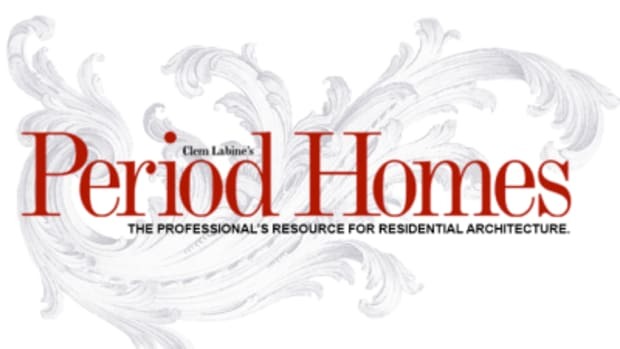 What do you need to consider if you are rehabbing an urban townhouse or building a new one? Laurie Wells, vice president of sales for Old World Stone in Ontario, Canada, advises that you understand the performance qualities of stone in your area. Some stones are durable, but some have high failure rates. She cites Lake Superior red sandstone, used in the Chicago area, as an example of a stone with a high failure rate and one that does not respond well to patching. Wells has replaced this stone with St. Bees sandstone from Cumbria, England, with great success. The projects often begin with a set of design drawings prepared by an architect. The drawings outline the parameters of the work and make bidding possible. Once the job is bid, usually the general contractor or specialty stone contractor will reach out to either a stone fabricator like Old World Stone or to a draftsman like Alan Barr of Stone Details in Burlington, Vermont, to prepare shop drawings. Both Barr and Wells stress the importance of site visits and taking and verifying measurements, made easier and faster today with laser scanners. 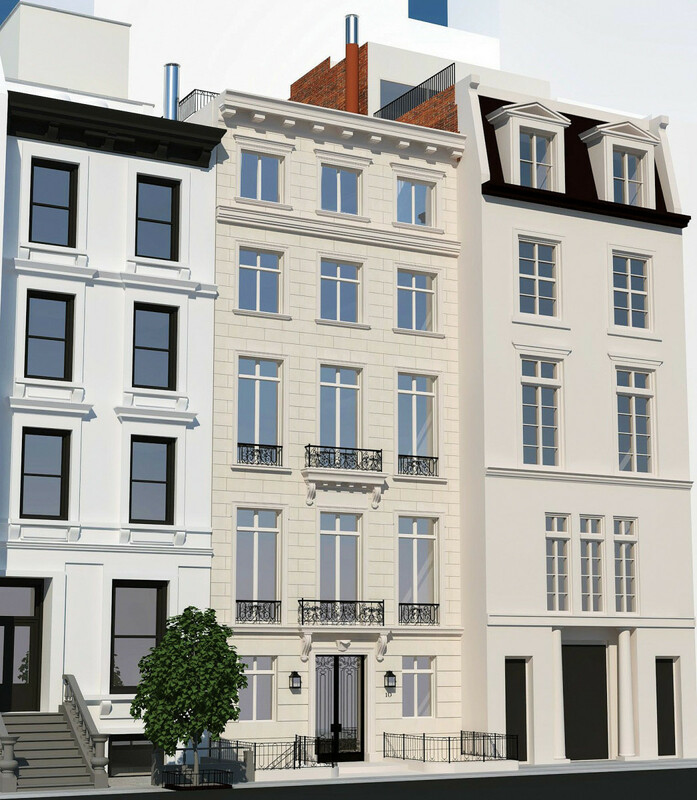 There is a rhythm to townhouse neighborhoods. 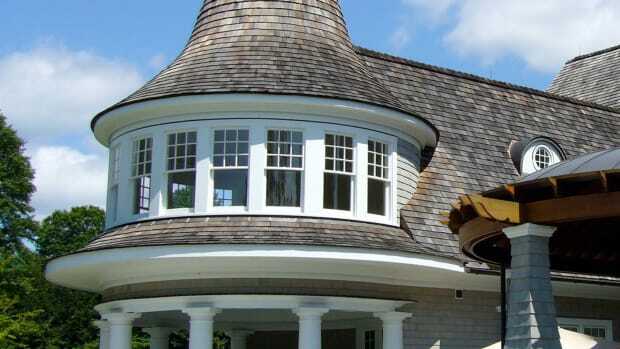 Usually there is a shared setback and similar heights but the individual facades are often punctuated by different architectural details and roof styles. As Barr explains, “The purpose of the shop drawing is to reflect back to the architect our understanding of their design, as well as provide exact instructions and dimensions for fabricating the project.” The architectural drawings show only the broad-brush elements of the design. They may not, for example, show joint patterns, corner conditions, course heights, joint sizing, transition details from one element to the next, stone depth, stone anchoring and exact stone sizing. The purpose of the shop drawing is to incorporate all these details into a drawing, submit it to the architect and get approval that indeed the shop drawings conform with the architect’s design intent. The shop drawing can also show the anchoring method for each type of stone. On complex jobs, a structural engineer will also become involved to fully detail and specify the anchor types, size, and method of attachment to the building. These details are usually then incorporated into the shop drawing set. The shop drawing becomes a contract document, meaning that the shop drawing represents exactly how the stone will be made. This document holds everyone accountable to a final design. This is what will be produced, and if produced to these requirements, this is what will be accepted. This process could take months and have several submittals back and forth as details get refined. There are layout or placement drawings as well that provide a map of where the stones will be installed. When everyone agrees, then the stone can be fabricated. 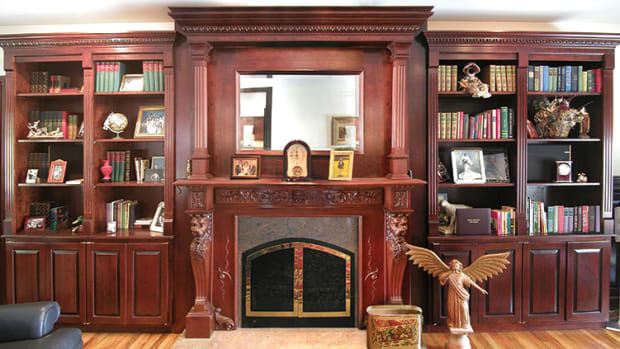 The most popular designs are executed in sandstone, limestone, marble, or granite. 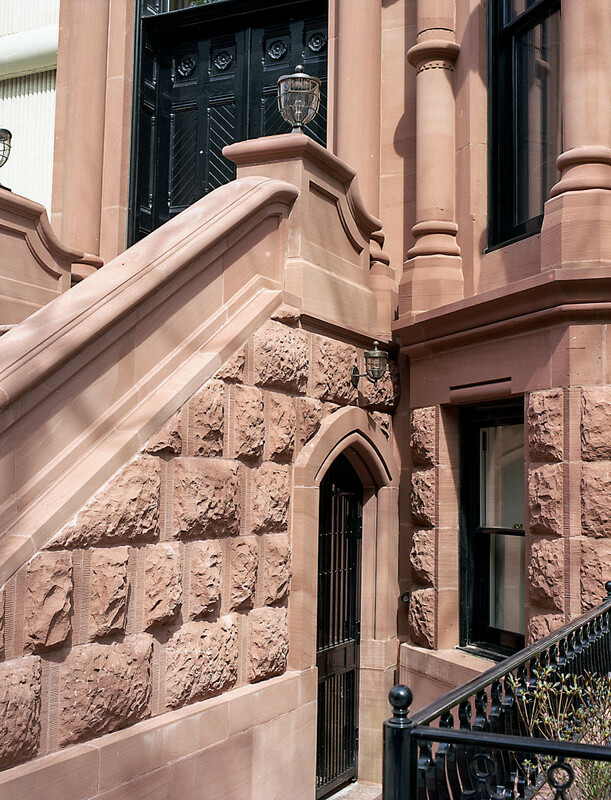 Chicago townhouse stairway—smooth, incised lines and rusticated blocks. Michael Lynch agrees. Lynch believes it comes down to the quantity and number of elements being replaced. You want to avoid a checkerboard-like appearance of new and old stones side by side, he says, and the attempt to weather the stone with blasting doesn’t usually result in an exact match. With existing limestone, for example, the color of the stone will have changed from when it was fresh. A small repair is one thing, but large repairs warrant caution. He tends to let the new stone simply age in place, and clean the existing stone to freshen its appearance so it more closely resembles the new work. Barr and Wells concur that prompt communication is critically important and that changes need to be documented and agreed to via the drawings. The drawings convey the plan but are also the means of communication. Old World Stone often works with and trains the masons or installers who are charged with completing the job. Wells likes to start small with repairs and move on to the more visible, larger repairs, giving skills time to develop on each job. This is not always possible because on stone projects, one usually starts at the base of the building due to load-bearing considerations. The lower levels of a building are more visible to passersby. The biggest competitor to the use of dimensional stone is a method of patching the existing substrates and then covering the substrate with a cementitious material that is scored to look like stone. In large urban areas with people skilled in such application, this has gained favor as a cost-saving method. Both Wells and Lynch worry about whether the condition of the substrate has been adequately assessed. If the building has been damaged by water infiltration for years, that substrate may also be unstable. The Secretary of the Interior’s Standards for Rehabilitation favor in-kind replacement of dimensional stone, but are not always followed by local preservation commissions, which are often more concerned with appearance than structural stability and long-term performance. Cast stone is also a viable alternative for many jobs and should be matched if it is the original material. 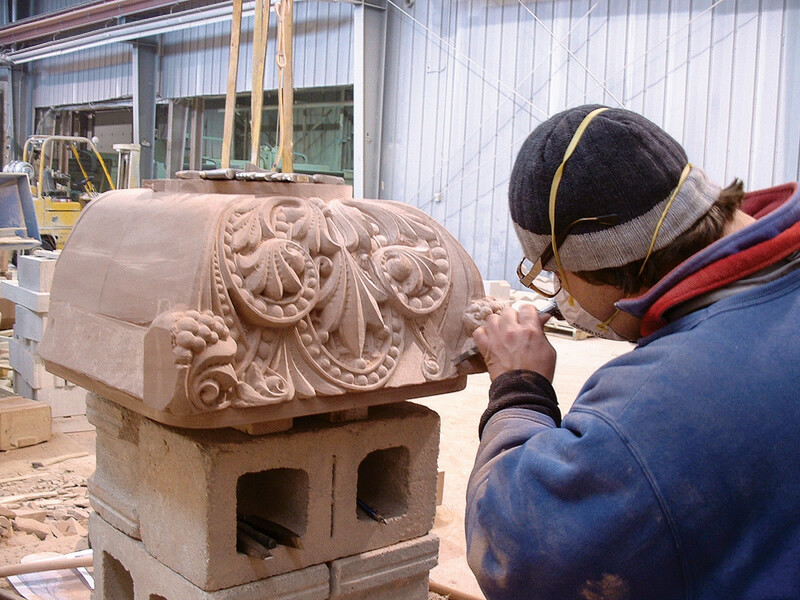 A stone carver from Old World Stone carves detailed ornament for a capital. The successful use of dimensional stone demands good craftsmanship, thorough conditions assessment, engineering analysis, and good working drawings that are agreed upon by all the participants in the project. Michael Lynch: The Stone Industries by Oliver Bowles. Published by McGraw-Hill Book Company, NY. 1934 (1sted) and 1939 (2nd ed.) As Lynch notes, it features chapters on all the major North American-sourced dimensional stones used in building construction with characteristics, industries by state, quarrying methods, market range, etc., plus a discussion of foreign building stones. There is also a chapter on “Deterioration, Preservation and Cleaning of Stonework.” The section on deterioration mechanisms is very still useful, and the section on cleaning includes many warnings about abrasive and over-cleaning that seem to have been forgotten after World War II. What is the classical ideal when we talk about architecture and art? The ICAA and top architects discuss how to refine the focus of the Classical Arts. What’s New in Wood Windows? From Noise reduction to UV-ray protection to historic replication to smart technologies, these window manufacturers offer new solutions to specifying windows.